Char Siew Bao (Char Siu Bao) - A favorite Chinese dim sum recipe, featuring roast pork steamed buns or Chinese barbequed pork buns. So easy and delicious! Lydia is a great cook and makes some of the most authentic Chinese and Malaysian dishes around. Please welcome My Kitchen to Rasa Malaysia as she shares her Char Siew Bao/Char Siu Bao recipe (Chinese roast pork or barbequed pork buns) with us. What’s more, she made her Char Siew Bao/Char Siu Bao (叉烧包) from scratch. Now, that’s what I call a no-cheat great cook! A while ago, I received an email from Bee–Rasa Malaysia. I have been following her blog for quite some time but never expected to be invited as a guest writer on her blog. What a big surprise and honour to me! What dish should I bring to Rasa Malaysia? Bee suggested char siew (Chinese barbecued pork) but since I made char siew before, we settled on char siew bao/char siu bao (steamed bun with char siew filling). Char Siew Bao/Char Siu Bao is one of the signature dishes in dim sum restaurants around the world. This irresistible little steamed bun is soft and fluffy, filled with slightly sweetened char siew. It is a must order item whenever we visited a dim sum restaurant. My other half loves it too, but he usually eats only a quarter of bun. He is a small eater, would not be able to eat other dim sums if he had a char siew bao by himself. Now, I am glad that I can share this yummy bun with my 14 month-old boy. Yes, I have made him a char siew bao lover too! In Malaysia, char siew bao/char siu bao is also available in Kopitiam (literally means coffee shop in Chinese dialect) together with other savoury and sweet steamed buns. Compared to char siew bao served in restaurants, Kopitiam version is bigger in size and has no opening on the top. Taste wise, they are similar. 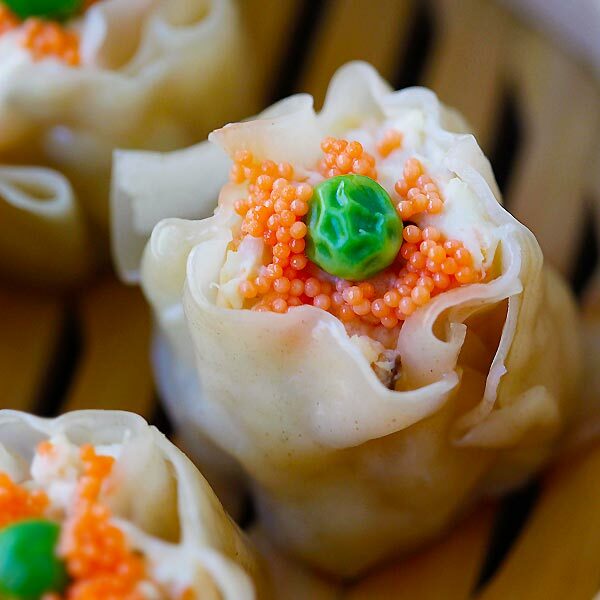 Steamed buns made with the mixture low-protein flour and wheat starch are fluffier and softer than those using only low-protein or all purpose flour. For the filling, I used ready-cooked char siew since I am living in Malaysia now and it is readily available. If you are making your own char siew, the recipe is available on my blog. Char Siew Bao (Chinese Roast Pork Bun/叉烧包) - you can make these from scratch! Dissolve baking powder in cold water, sprinkle over dough and knead until well combined. Divide dough into 16 equal portions and flatten with a rolling pin to make a 3” circle. Then place a heap teaspoon of filling in the middle, wrap and pleat the dough to seal. Place it on a 1.5” square parchment paper, seal side up. 1. If bigger bun is desired, divide dough into 12 equal portions in step 5. 2. There is no need to rest the dough after adding in baking powder, but if time allowed, rest it for 10 minutes or so to get fluffier buns. 3. Adding a few drops of vinegar into steaming water will produce whiter buns, but this is optional. 4. Steamer must be preheated otherwise bun would not rise to the volume as it should be. 5. Spray the surface of bun with water mist helps to produce buns with smooth surface after steamed. 6. DO NOT open the lid during the steaming process. 7. If there are yellowish spots on the steamed buns, it means the baking powder is not fully dissolved. Awesome awesome awesome awesome!!! When some people think of comfort food, soup or mac and cheese or burgers come up– mine is siu bao :) I’ve always wanted to make my own! Thanks Lydia (love her blog, btw)! … Might have a problem finding low protein flour, though. Don’t want to use cake flour! I don’t think it makes a good result! You are welcome! I like this bun, but I would say big bao in Malaysia will be my comfort food. It is hard to find low-protein flour, but I think you can find Hong Kong flour or bao flour easily in Asian market, they are low-protein flour for bao. I love char siew and making it so I think I am just a few steps away from making these buns! Delightful post! Thanks! How’s your char siew and buns making? make it myself… very tough la…. You know where to get good one, don’t have to make. Other than Shanghai Ding, where to get good char siew bao and dim sum in Penang? I love those steamed pork buns but have never attempted to make them! These sound good. Try to make some, you can make them with variety fillings. My husband loves char siew pau but not the steamed kind. He likes the baked ones. Can I put these in the oven? or does it need a different kind of pastry? You will need different pastry, something like puff pastry. I think the one your husband likes is siew bao (烧包), with crispy and flaky pastry. Actually I baked some of those and 叉烧酥 today for a mahjong gathering at friend’s house. Will post the recipe on my blog soon… check it out. I have been on the lookout for a recipe for these things for ages! I have such wonderful childhood memories of going to Chinatown for them…now all I need is a good soup dumpling recipe and I’m all set. I missed those days going to coffee shop with my dad before school, and we had roti canai there. Even though we had little thing to talk about but I missed those moments. I think the soup dumpling recipe is available on Rasa Malaysia too. I recently found this at at Ralphs in California, in a mostly caucasian city. It’s fantastic. I always have a bag in the freezer now. The frozen bun looks so prefect! Btw, I made my own frozen buns with this recipe. Steamed, cooled, keep in ziplock bag and store in freezer. When I need it, just thaw and heat up in microwave or steamer (5-10 minutes). Gosh these buns look so yummy. I’ve tried using the premix flour… but I will try this recipe for sure. Thanks for sharing Lydia/Bee. My first attempt on steamed bun was using the premix. Now, I am happy with this recipe and no more premix. Hope you will like this recipe too. Those look positively heavenly! The texture just looks so perfect. This is the recipe I have been searching for. Must give it a try one day. Tks for sharing, Lydia. Great post! I am giving your pao a 5-stars rating! lydia, my wife makes them with prepacked Pau flour. Are they the same with the hong kong flour in this recipe? Most probably same with hong kong flour, but please check the ingredients listed on the package. I used bluekey brand and it contains low-protein flour and approved food conditional. When you said low -protein flour such as bluekey brand low-protein flour , what is the Protein content in g per 100g of flour? Thank you. Bee, thanks for giving me a chance to share my recipe here. Yummers!! I made these last night, there were delicious – the dough was exactly like the restaurant, light and fluffy. But I have just one question, how do you get to bao to “smile”, that is puff up and “break open” during the steaming process (like the restaurant)? After years of dreaming of making my own char siew pao, I finally made it. Thanks to your Blog! However I still found my pao not as white as those sold in kopitiam and the texture not as soft. Do the coffee shop paos contain any bleaching agents? Can you or Lydia help please? Your buns look so good. However, I cannot find any “wheat starch” in the supermarket. Is there another name for it? I live in Singapore so perhaps it is called something else? I am looking for a simple recipe for Roasted Pork which is also one of my favourite dish in Malaysia. What seasoning do you add to the pork prior to roasting which I usually use a griller?. 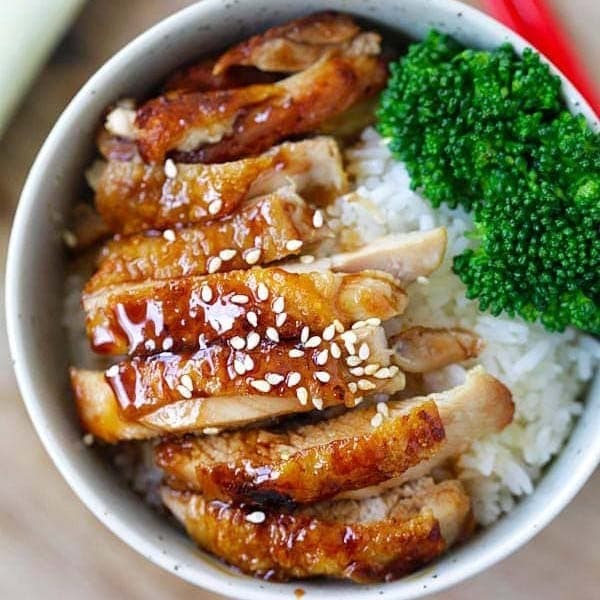 Have you checked out my char siew recipe? Is the Char Siew supposed to be pre-flavored when bought or do you just use regular pork + the listed ingredients? I am confused about that. 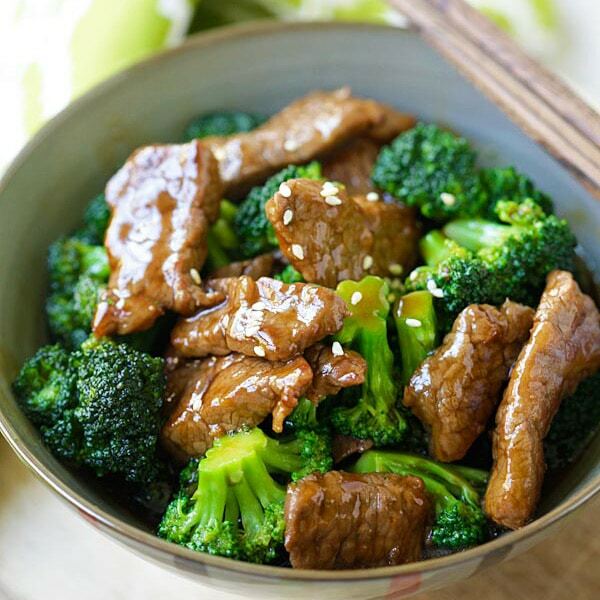 Very nice recipe. Just one question- why does the baking powder have to be added in a seperate addition ? How does it affect the final result of the buns? These look great! Thank you for sharing!!! can i use cake flour as a substitue for low protein flour, as its very difficult to find where i live? Hi, i’ve been dying to get the perfect recipe for pao buns all these years. I’ve tried many different kinds of flour but have never been satisfied with the result everytime. I have yet to try the hongkong flour, I live in Singapore and I’m going to look for it in the supermarket first thing tomorrow. I want to achieve the soft and fluffy texture like the commercial ones. If I may add, should I put bread improver to the dough mixture? I make bread sometimes, and it really helps. :-) By the way, your version looks promising! I just discovered your blog and followed this link here. Your cooking is impressive to say the least and very varied. I never thought of making my own bao but may just attempt it one of these days. Someone had asked what is wheat starch. I’m stumped too. Can you tell me what this is? 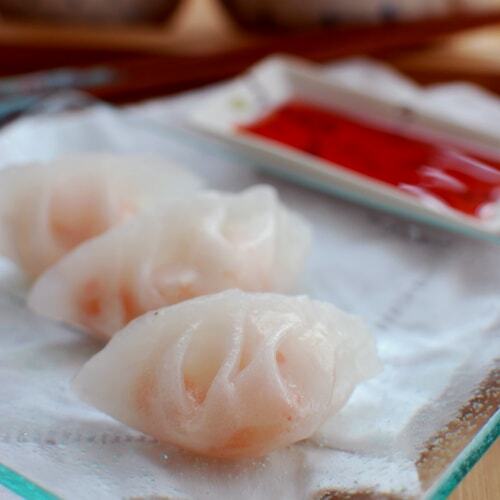 It’s the flour to make dim sum, for example: the skin of shrimp dumpling or har gow. I wanted to check if 8g of yeast was correct because it seems like a lot? What should I ask for when I try a Chinese supermarket because they had a limited range of flours and they did not understand what kind of flour I wanted when I explained to them it was for making bao? Dr. Congo, this is a guest post so please check with the guest blogger for the information. I am sorry I can’t be of much help. Also what is the purpose of the wheat starch? I think you mis-understand (or maybe I do!). q1. Is 8g of yeast correct as it seems a lot? q2. What is the purpose of the wheat starch? Dr. Congo, if you read the article, the recipe is submitted by my guest blogger, so I didn’t make the char siew bao and so I don’t have the exact measurement. You can click on the link to the guest blogger’s site and ask her. Sorry I can’t be of much help. I thought you put that recipe up ! can you please tell me what’s wrong? I try the bao recipe it turn out ok. My it finish my dough were hard its not soft and fluffy.I think I’m doing something wrong with the conversion. Need help with the conversion. I live in India but when I travel abroad – All i eat is Char Siu bao – I’ve loved it ever since I was a child. Anyway I tried your receipe using all purpose flour. I’m to travel to Malaysia over the weekend and wanted to know if you knew where I could possibly get Hong Kong Flour or if you can help me in understanding what I should be looking out for? Would China town be the best place? Any particular brand of flour? You can go to any big supermarket in Malaysia and should be able to find it. Good luck! What is a substitute for Hong Kong flour? MMMM!! I have been craving this for years, and I’ve been looking all over the internet for the right recipe! Thanks so much for having this available! I LOVE your site!!! Both of you! I would LOVE to make this. Looks better than the baos at our local Chinese restaurant. You can use online conversion tool to find out the measurement, sorry. I made this with some slight adaptations. It was very good. I just did the steamed pow. The filling was good but the dough was the not as soft as i expected it to be. Followed your recipe closely but…. is there any reason y? HELP….. Its my all time favourite and i want it to be good. Will be selling it for charity in church….. HELP……. Hi! Thank you for this recipe and I have tried it. It comes out a bit dissapointed cos the yellow spots did appeared on the pau. Can you please advise me how long do the baking powder mixture need to dissolve before adding to the dough? Thanks. I love char siew buns very much and i tried to make it for my parent, but have afew problem with buns after second steam it become dark yellow on the whole dough , if you don’t mind pls held me how to solve this problem . I don’t have corn flour. can I just use corn starch? I have given up on baos…none of the past recipes I tried produce the soft, fluffy ones found at Dimsum places but I shall try one more time, using this recipe. From what I understand…hong kong flour is basically bleached all purpose flour which has lower protein than bread flour and bleached so the baos will be whiter. Wheat starch is supposedly flour from which the protein had been removed, again an attempt to lower the protein content of the flour mixture. Protein in flours is what produces gluten which is responsible for the “stickiness” that produces crusty breads (artisan). I think bao was discussed more extensively at one point at the kitchencapers.com forum. I forgot…supposedly, the yellow spots are due to undissolved/unevenly distributed baking powder…oversteaming also produces yellow baos. I’ve always wanted to make bao, since they were my favourite special treat when I was growing up. I’ve tried making them before, but they were pretty bad, since I only had regular flour and they came out very heavy, yellow and yeasty. I had a bit of trouble while using this recipe – my yeast sachets were 7g instead of 8g, and I couldn’t find Hong Kong flour or wheat starch over here in Scotland. For Hong Kong flour I used a mix of 180g self-raising fine cake flour and 100g plain gluten free flour (a mix of rice, buckwheat, potato etc flours), and for wheat starch I used the same quantity of cornflour (cornstarch). The gluten free flour seemed to need more water than regular flour, so I added a couple of tbsp extra. The dough didn’t seem to rise at all, and I was really worried about ending up with stodgy lumps, but when they were steamed they were perfect! They ended up very slightly beige in color rather than white, but they were fluffy and tasted right. I want to make this dough. It kind of looks difficult. It looks so soft and fluffy and you make great photos. Can u pls tell me where can i get “Sau Pau” (longevity buns) in KL/PJ. This pau is mainly for birthday celebration only. I’m from Trinidad and Tobago (Caribbean), and here Char Sui Bao is called ‘Chinese Pow’ and is incredibly delicious! Instead of hong kong flour, can I use plain flour/all-purpose flour? this recipe looks wonderfully fluffy! i am now sure if low-protein/hong kon flour is available at my asian supermarket, but i see some recipes calling for glutinous flour. would that work?? if so, is there a difference between glutinous flour and glutinous rice flour? Glutinous rice flour will not work for this recipe. Yes glutinous rice flour = glutinous flour. Brenda, I used cake flour and it worked PERFECTLY. You can do an easy substitute if you don’t have it using an all-purpose and cornstarch combo (just google “substitute for cake flour”). This is the best bao dough recipe ever, and I kind of love you right now! They turned out perfectly! THANK YOU! Hi I tried the recipe and buns turn out quite well except the buns are polka dotty ;( caused by the undissolved baking powder. How do u sure they are completely dissolved? When I add in the baking powder in the cold water, it became foamy and then I knead into the risen dough. Please advise if I miss out any step or appreciate any tip. Thanks. HI, I also faced with the same problem; polka dots.. How can we know the baking powder is properly dissolved???? Pls help… Otherwise the pau is superb!!!!! Hello, may I use wheat flour instead of wheat starch? Actually wheat flour and wheat starch are different. you can find it at and asian food store in the flour section. Hi… What is wheat starch called in chinese? Can I find in supermarkets? Hi, what can I substitute for wheat starch? Thanks! Sorry, you have to use it. Hi! Is the baking powder, double action baking powder? It’s your flour. Get a lower gluten flour or cake flour. Do you mean step (1-4) is done in the bread maker? I just made these last night (after a few repeated failures from other recipes). It was perfect!!!! Thank you for putting up this recipe! Can I use white rice flour? This bao recipe is the BEST! I had wheat starch on hand because I make har gow frequently. The low protein flour I had to seek out, and my local asian grocery doesn’t have everything labeled concisely in English but I found one (it said “Special Bun Flour” but I had to make sure that it didn’t contain any leaveners already mixed in). I also found out that using cake flour (a comparable low protein flour) will work just as well. Anyway, I’m still working on my shaping-the-bao technique, but one trick I found pretty useful was using a small round mustard dish to drape the rolled-out dough on. This leaves a convenient little pocket for my filling and leaves me two hands to pleat and pinch the bao closed. I was able to put a lot more filling in each bao, and keep the pleats clean of filling residue so they would seal better. Maybe someday I’ll be as dexterous as all of the YouTube demos I’ve watched of ladies producing these flawless doughy gems, but until then my mustard dish method helps my baos from looking like misshapen lumps (and speeds up the whole process). Hi, Miss Bee! 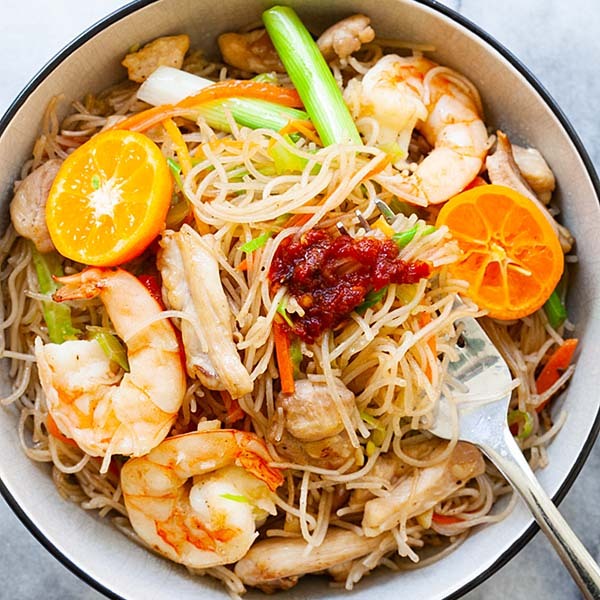 I am Fililpino currently based here in saudi arabia, I tried your chicken noodles recipe last night and got great comments from my Saudi “eaters”. So now, I’m planning to try this. Thanks for these delicious recipes. God bless and more power. I spent yesterday afternoon hitting the Asian markets and was able to find a Red Lotus special flour for steam buns. It’s a white flour with about 8-8.5% protein content. Using Lydia Teh’s recipe, I’ve made 3 batches of dough. While easy to use,the buns are flat and dense in consistency. I’ve made dough using recipes with all-purpose and self rising flour that also produced dense buns. In fact, I just bought and made buns with one of those ready made flour mix. They are yellow and dense. How do I make buns that are light and fluffy in texture like what is served in the tea houses and steam box of the Asian markets. Yes. It’s not completely dissolved. Can you please expand your answer. Tell the 2 ladies above how to determine whether the baking powder is dissolved. You have not reply to their enquiries. I would like to know too inorder to avoid the dots. Thanks in advance. 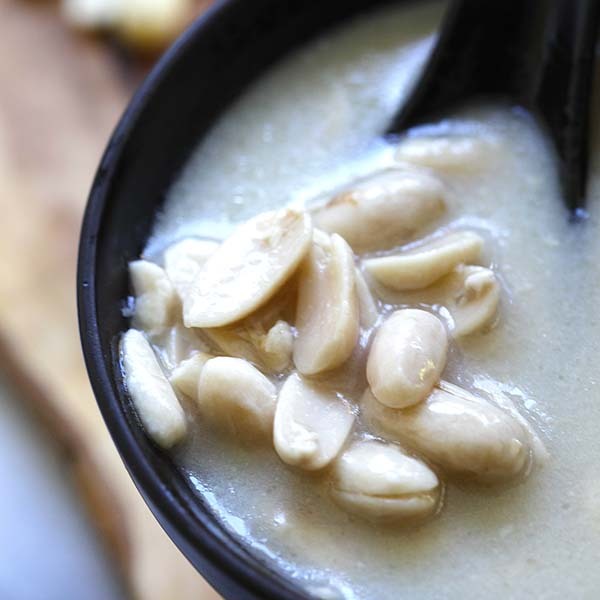 This recipe is from guest blogger Lydia Teh. The step said to dissolve baking powder in water. You have to make sure that there is no more lumps in the water and that the baking powder is completely dissolved before using. To be very sure it’s completely dissolved, you can filter the mixture and dissolve the remaining solids. Hope this helps. can you tell me what is the purpose of wheat starch in bun recipe? I like your recipes, and they usually turn out very well. Do you think I can replace pork with chicken because some of my family members do not eat pork? I could eat a dozen of these things in one sitting. Can’t imagine only eating a quarter of one. It’s probably why I’m so fat. what is icing sugar? is it confectioners sugar(powdered sugar)? I made this with ‘dumpling flour’ and wheat starch from my local Chinese wholesalers – they came out absolutely lovely and fluffy. i’ve been so disappointed with normal flour versions – but these came out as good as any i’ve had in a restaurant. Can I ask when you say low protein flour, what % of protein is suitable for this recipe? I live in Australia and the lowest protein flour I can find in my australian supermarket is cake flour which is abt 8.7% protein. I haven’t had much luck finding any lower % even in Asian market. My dough kept turning hard. How do I make it so it is fluffy all round? Did you use the right flour – Hong Kong flour? No. I used rice flour. What is Hong Kong flour? You can use cake flour. Rice flour is not wheat flour. You can’t use rice flour to make this. Thank you very much, Bee-sensei! The recipe look yummy, am surely going to try this soon. Just wondering, is it possible to premake and refrigerate this pau, and to steam only when it is to be eaten. If so, for how long does it keep? Thanks again for another great recipe. Tried it yesterday and your recipe is perfect! Thanks again for another great recipe! Tried it yesterday and it was perfect! I want very much to try this recipe but I don’t know the equivalent of grams. I always make recipes with cups and tablespoon as measurement. Thanks. You can use the conversion tool to ounces. But I wouldn’t do cup conversion for this recipe because it needs to be very precise. I have just tried the recipe. buns fluffy and soft but with polkadot on the surface.This doesn’t look good. can I add in the baking powder at the beginning together with other dry ingredients. My buns didn’t rise when I steamed it, even though I already preheated it. How can I make it rise? What a super recipe! I found the flours I needed at a fantastic Chinese supermarket in Bristol, UK where I live and made these last night and they worked beautifully. I strained the baking powder/water mix through a tea strainer before working it into the dough as you suggest and there were no spots or discolouration and the buns had that lovely shine on them. Thank you so much for this! Thank you for sharing this great bao recipe. Just made this and they turn out great. Fluffy and soft. Shiny outside and smooth outside. This recipe is gonna be a keeper. Thanks again. Hi! Can i possibly use pastry flour in Bun recipe? No. I just tried pastry flour out of desperation and it was totally wrong. It came out with the taste and texture of whole wheat bread crust crossed with a matzo ball. No you have to use Hong Kong flour or bao flour for steamed buns. I would like to seek your advise on how to get the pau skin to be white” they turn out nice n fluffy but instead of white , it’s brown. Sometimes lighter, but I made them yesterday n color is on the darker side of brown like I am using brown sugar which is not the case. Hi, can i use Pao Flour and kneed using Breadmaker? Made these baos today and they came out soft, and good to the bite! I had wheat starch (Tang Mien), so I decided to give this recipe a try. I have always used my favourite pao recipe and they are just as good but requires certain steps. This recipe is great as I love the chewy and soft texture! The only thing I did differently was to knead 40 mins in my bread machine then according to sequence and added the baking powder accidentally with the flour. However, it came out just as nice and fluffy! Thanks for this recipe! The amount of yeast 8gm for 280gm of Hongkong flour (and 100gm of wheat starch) in the recipe. Is that correct? I tried and the dough smell and taste of too much yeast! Please confirm the amount. Thank you. Kind regards. Ok thanks Bee. Tiffany, I saw your comments that your baos came up nice and fluffy. Mine came out with too much “yeast” taste. I love your blog, and have booked marked a lot of your recipes. I have been looking for the perfect bao recipe, and is still am. I tried this version of the bao, but mine turned a tad sweet. I tried this version a few times, and I noted the advice above to make sure that the baking powder is well mixed, and I did, but how come my bao still have some brown blotches? Also the dough is “heavy”, i.e. dense. Did you use Hong Kong flour? Is the icing powder substitute for sugar . First time I encounter using icing powder for bao dough. Why icing powder instead of sugar? hello, here in my country Ecuador, dont sell wheat starch, what can i use instead? Fortunatly, I make char siew bao, but what about meat ball ? i have to steam them longer, …and I will have a yellow bao surely… help me please, thanks.